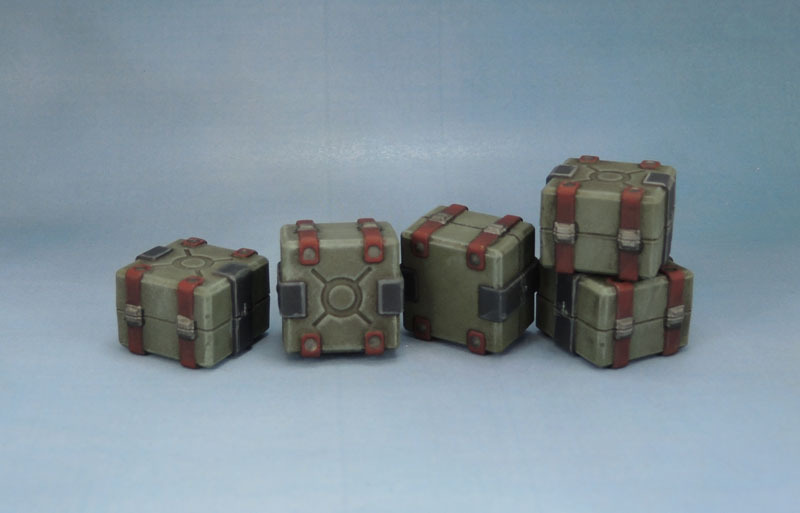 Sedition Wars Terrain Set Crates | Azazel's Bitz Box. Recently I completed and showed off the barricades from the Sedition Wars Kickstarter’s Terrain Set. 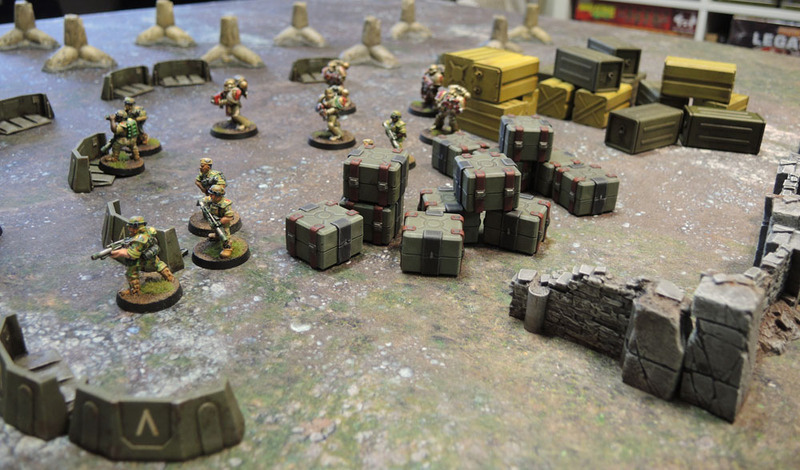 Today I have some more scatter terrain to share – specifically the crates. 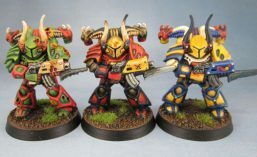 Not my work, but the work that inspired these getting painted after all this time. 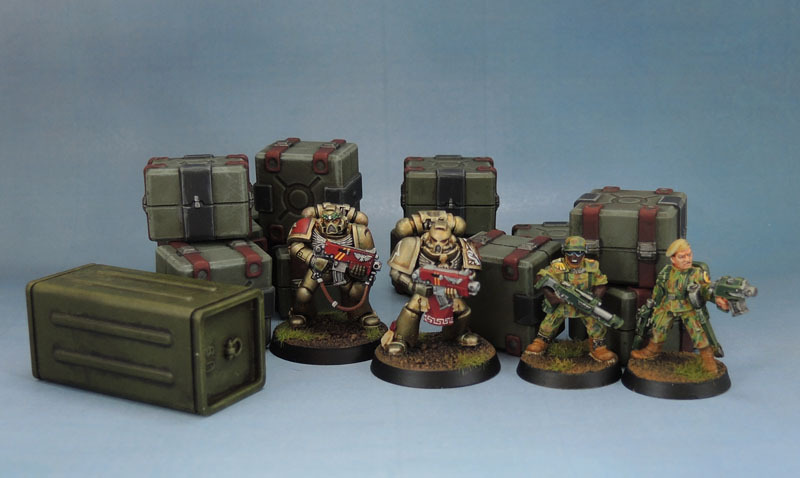 Clicky the pic to go to Agis’ site for lots more Imperial Assault goodness. As can be seen, I gave them a light weathering, though not to the level of detail or care that Agis did on his. As far as scatter terrain goes, they’re really just more of the same sort of stuff I usually churn out at the level I’m happy to go with, generally. Not superbly exciting by any means, but additional, solid looking stuff that looks better than simply a spray and wash, a bit of extra weathering, though not nearly to the effort put in by people like D&B in his diorama-level pieces. Oh, I also found and finished one more of those U.S. DUST Tactics Supply Drop Crates, so it gets a guest appearance in this photo. And finally, some “in action” type shots alongside some of the other appropriate scatter terrain I’ve finished in roughly the last year. 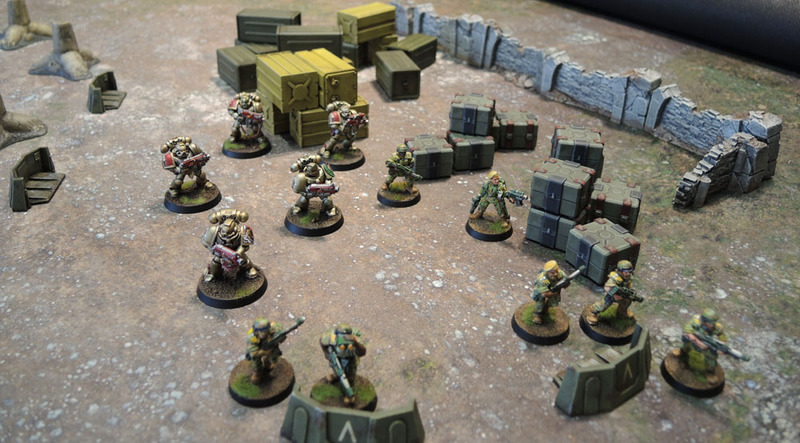 DUST Tactics Supply Drop Boxes, DUST Tactics Dragon’s Teeth and Confrontation Walls, and the very recent Sedition Wars Terrain Set Barricades. There’s not a lot of height variation, nor any foliage, but just these bits of scatter make a passable battle site for a small combat patrol sized skirmish. This entry was posted in 40k, Sci-Fi Gaming, Wargame Scenery and tagged Confrontation Walls, DUST Dragon’s Teeth, DUST Supply Drop Boxes, Metal Cadian Imperial Guard, Metal Imperial Guard Cadian Models, Minotaurs Space Marines, Sedition Wars, Sedition Wars Terrain Set Barricades, Sedition Wars Terrain Set Crates, Urbanmatz Badlands Mat. Bookmark the permalink. More nice scatter terrain. They’d also make good objective markers or archeotech things too. Thanks Alex. They’re nothing too flashy, but they’ll make for a bit of cover or deco on a variety of battlefields – and that’s all I’m after from them. Also, going from “in a storage tub for years” to painted is always a plus! Thanks Mark. It certainly helps to add details to the battlefield to compliment the big terrain pieces. Looks all good to me. Good colour choice, nice subtle weatherign adn not too flashy what regards highlights. They remind a bit of companion cubes. Could be nice scenario – survive the Portal parcour. That is perfect scatter terrain height! Thank you so much for the scale shots! No problem mate. 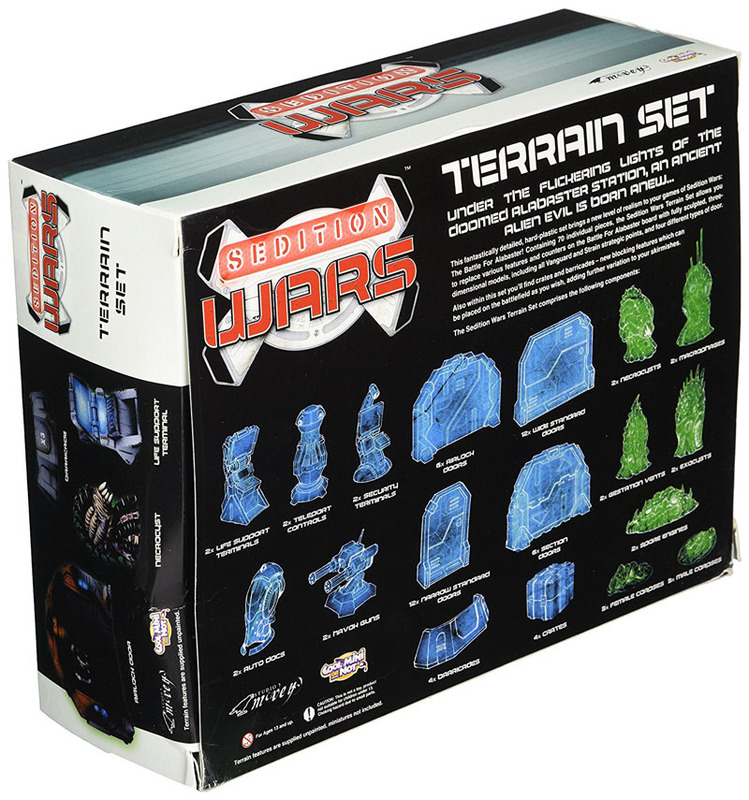 The SW terrain set is a good one, and probably an exceptional buy if you can still find any. Pingback: Dragon’s Teeth Tank Traps | Azazel's Bitz Box. Pingback: Shadows of Brimstone: Derelict Ship Auto Turrets | Azazel's Bitz Box. 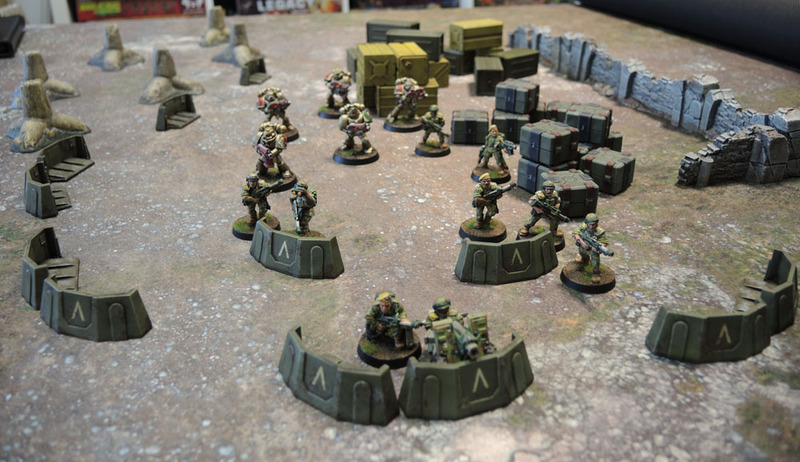 Pingback: Sedition Wars Terrain Set Turrets | Azazel's Bitz Box.